I created all my terms sets in my development environment, but when I publish in another environment is giving the error image. I went up the base "managed service metadata", but still meeting with the error "error loading navigation term SET NOT found" Does anyone know how to restore the term sets that made the development environment? As you have explained, the terms are setup on your Dev environment, and you are trying to use them on a different environment. Meaning you need to have your terms setup on this environment as well, before you could use them. The easier way is to recreate only the subset of terms you require on the target environment. Not the answer you're looking for? 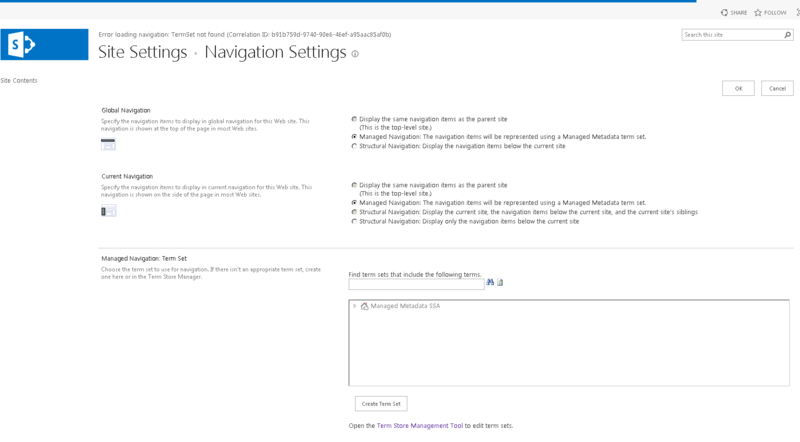 Browse other questions tagged navigation term-store term-set or ask your own question.